The Little Indian Gap Shelter was located in the Great Smoky Mountains National Park near what is today known as Indian Gap. 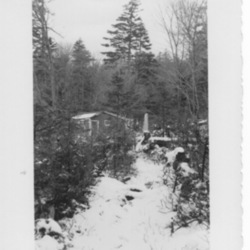 The Willis Ross Camp stood near the shore of Stratton Pond in Vermont until it burned in 1972 and was not rebuilt. It was an enclosed cabin-style shelter of the type often found along the Long Trail/Appalachian Trail in Vermont. It was built and maintained by the Green Mountain Club. 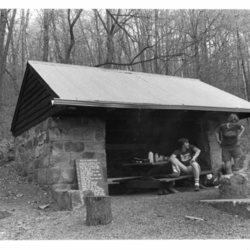 The Rentschler Shelter was located in Pennsylvania near Bethel, PA, and was built by volunteers from the Blue Mountain Eagle Climbing Club to commemorate Dr. Rentschler's role in founding their club. The shelter was built in 1933 and torn down in the 1960s. It was a partially closed front log lean-to, typical of the shelters built during this period in Pennsylvania, Virginia, and Maryland. A memorial to Dr. Rentschler remains at the site of the former shelter. 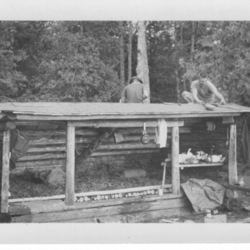 From reverse of photograph: "Replacing the Roof on the East Carry Pond Lean-to (1954)" The East Carry Pond Lean-to is one of the many Ghost Shelters along the Appalachian Trail. 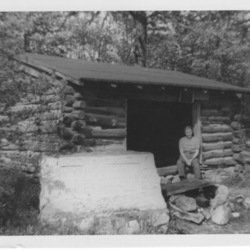 In this photograph from 1954, one can see that it was a small log sided lean-to structure with a shingle roof and a dirt floor. It was maintained by the Maine Appalachian Trail Club. 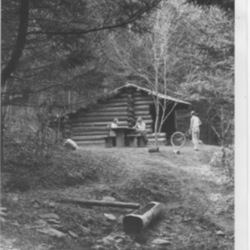 The Governor Clement Camp near Killington, Vermont, on the Long Trail/Appalachian Trail in 1959. The Governor Clement Camp is a stone sided lean-to and is maintained by the Green Mountain Club. The Pico Peak Camp, now known as the Pico Camp, in November 1959 shortly after its completion. This shelter is one of the enclosed plank sided camps along the Long Trail/Appalachian Trail section in Vermont. It is maintained by the Green Mountain Club. 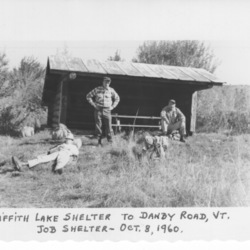 The Griffith Lake Shelter used to sit near the shore of Griffith Lake in Vermont along the Long Trail/AT route near Mount Tabor, Vermont. This shelter has been removed and replaced with a tenting site for hikers. It was maintained by the Green Mountain Club. 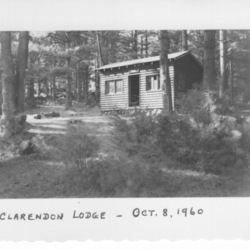 The Clarendon Lodge Shelter on the Appalachian Trail/Long Trail in Vermont in the fall of 1960. This enclosed camp has been replaced by a lean-to style shelter and is maintained by the Green Mountain Club. 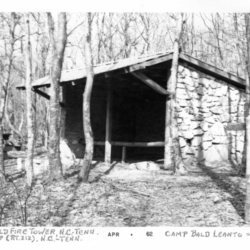 The Little Laurel Shelter on the Appalachian Trail in North Carolina was previously known as the Camp Creek Bald Shelter. Located just over a mile south of the summit, this shelter is a stone lean-to and is maintained by the Carolina Mountain Club. 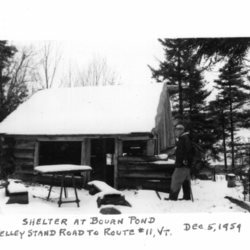 The Bourn Pond Shelter was located on the shore of Bourn Pond in Vermont, on a former route of the Appalachian Trail, now known as the Stratton Pond Trail. This shelter is one of the cabin style shelters found along the Long Trail/Appalachian Trail and was built by the Green Mountain Club. It still exists, just no longer on the Appalachian Trail. 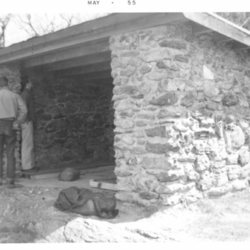 The Blackrock Hut (Shelter) is located in the southern district of Shenandoah National Park and is an example of the "hut" style of shelter, built from stone and logs. This shelter was completed in June 1941 and the current shelter is the original structure from 1941. 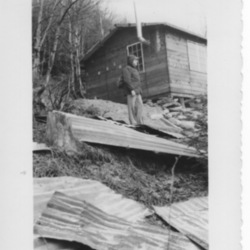 This particular image depicts a moment in the history of the park and its trail shelters when hikers were banned from overnight camping at or within site of the shelters. The sign leaning against the wall reads, "Overnight camping at or within sight of this shelter is prohibited." 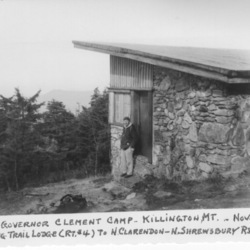 The camping prohibition was the result of the Park Superintendent's concern that the AT shelters had become party locations for Park visitors. His closure of the shelters was a point of contention between the Park and the Potomac Appalachian Trail Club throughout the 1970s, after which the camping ban was relaxed.